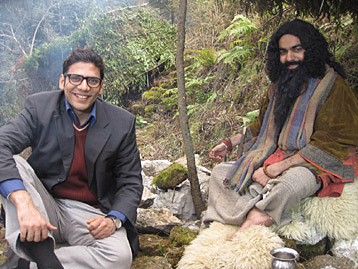 Rusty, the fictional avatar created by the Mussoorie-based writer to impersonate himself in his stories, will come to Doordarshan in a 52-episode serial, Ek Tha Rusty-2, after its successful run in the mid-1990s. The 26-episode Ek Tha Rusty-1 had captured Rusty as a youthful writer at 22, struggling to find a toe-hold in 1940s Indo-Anglian literary firmament. The new serial, based on 10 of Ruskin Bond’s short stories, follows writer Rusty’s life at 33 when he has established himself as a "writer of repute". It tries to bring out the adventurer in Rusty through the stories he encounters on his turf. Script-writer, director and producer Subhdarshini Singh, who had made Ek Tha Rusty-1 in 1990s, wrapped up shooting in Mussoorie recently after almost a month of rigorous filming for the first 20 episodes. "Rusty is the central character in all the episodes. The stories are not exactly Ruskin Bond, not the usual children’s stories, but are more romantic and thrilling, full of mysteries, murders, intrigues, revenge, passion and the strange characters which inhabit the hills," said Subhdarshini Singh. Rusty will be played by the popular face on the small screen Bipul Gupta, Singh said. "He is very good looking - has an Anglo Indian air about him. When Ruskin Bond heard about Bipul, the writer said he was not as tall as Bipul in his youth," Singh said. The cast includes Ayub Khan (The Sensualist), Suhashini Mulay (Ms Bean), Gaurav Sharma and six Sikh actors from Delhi and Chandigarh to play the sardarjis in Rusty’s adventures. However, the star of the show is Shristi Bond, the great grand-daughter of Ruskin Bond, whom Singh describes as a "dark beauty with high cheekbones and an exotic face". Shristi plays the 12-year-old mysterious Kamala, who captures Rusty’s heart. "But Rusty’s muse is Sushila (Priyanka Joshi), the niece of Rusty’s friend in Love is a Sad Song. When he comes to know that Rusty is in love with Sushila, he is aghast... The love affair ends," Singh said. The stories (and novellas) that Singh has chosen include Love is a Sad Song, Who Killed the Rani, The Sensualist, Dead Man’s Gift, Binya Passes By, Last Time I Saw Delhi, Time Stops at Shamli, Hanging at Mango Tope, From Small Beginnings and At Green’s Hotel. Singh has recreated the lifestyle, music and fashion of the 1960s, in which the stories are set. "Ruskin Bond helped me a lot with the whole atmosphere of the 1960s. He remembers everything of the 1960s - even the popular songs in English and Hindi and the Anglo-Indian culture," said the director. Singh, who made subtle changes in adapting the stories into screenplays, was helped by her oncologist son Nikhilesh Pratap Singh. Singh said the serial is interspersed with "sweet romantic details - complete with an old-world rickshaw" which was commissioned all the way from Meerut. Rusty pulls the rickshaw with his lady love on it. And she swaps places with Rusty to pull it in a spirit of romance. "It is a sequence from the 1960 movie, Love in Shimla (Joy Mukherjee and Sadhna)," she said. According to her, creating the old Mussorie was difficult because the landscape has changed. She said, "The whole city is in a mess. At every location, I had to clear the trash lying around. But I had some good friends who gave me their homes." Singh, who worked for her last serial out of the Savoy Hotel 15 years ago, had to settle for lesser-known locales. "The city has wonderful heritage properties but one has to see to believe what they have done to the old buildings in the name of restoring them. The government should take over some abandoned buildings and convert them into a film city complex... It is a good location for shooting," Singh said.